There's some free DLC on the way, too. 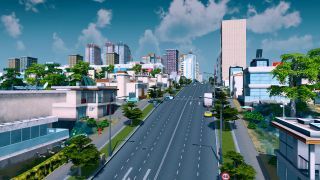 It seems Cities: Skylines has done rather well for Colossal Order, and for publisher Paradox, shifting over 3.5 million copies to date. It's also the second anniversary of the enormo-city builder's release, so in celebration the developer is putting out some free DLC, which will be "available soon". Pearls from the East will offer up a bunch of China-themed buildings to all players, with the free download comprising "a Panda Zoo, a Chinese Temple, and the Shanghai Pearl Tower", all of which should add a splash of Asian flair to your metropolises. That's not the only DLC coming soon to the game, of course, as you'll imminently be able to incorporate the Mass Transit expansion, which whacks in monorails, cable cars, and flying blimps, among other bits and bobs. We can finally recreate the alternate universe from Fringe! Oh, but only if the next expansion contains that weird amber stuff that was being used to close dimensional breaches. Here, have a read of Chris Livingston's delightfully silly Cities: Skylines Christmas adventures.